"We embody the Turkish culture and how we share those values with our customers. To ensure quality and freshness, we make everything made-to-order and get our ingredients from local vendors that we know and trust. This is our recipe for perfection." My stomach is making grumbling noises as I write this article because I am imagining again the tender, flavorful meats and addictive rice that came to our table during our visit, wafting tempting savory steam. I have always known that I loved Mediterranean food so my interest was definitely piqued when Yalcin Aslan, founder and owner of DonerG, invited us to try out his restaurant which said both Mediterranean and Turkish in the name. Curious at the differences or similarities between the cuisines, I readied up for a visit at the Irvine location, the second in this line of soon-to-grow restaurants. Immediately upon entering, Duc and I could tell that this was a place that really cared about its food and appearance. My favorite color combination of red, black, and white covered all parts of the restaurant from the walls to the counters. It was chic and modern enough to entice young and old in but casual enough in concept that everyone could enjoy a stop. The food was obviously not of modernist cuisine about which we were happy - we much prefer the sight of a spinning spit of meat, glistening in its juices and oils. Spotting Yalcin was the one thing that snapped us out of the moment of staring (and perhaps drooling over) the stations. If you're trying to figure out exactly how to pronounce DonerG, the first part sounds just like "donor" but with a slight elongation of the second syllable. The G is just like it sounds - "gee." Why the name? Yalcin was pretty excited to tell us how the name was born and demonstrated using my pen and paper. Apparently the most well-known dish itself is called a doner kebab so that the places that serve up the kebabs are called, in Turkish, donerci. Translated, it refers to the person who is making the doner kebab and aurally, it sounds just like the English letter "G" so to Yalcin, it only made sense. DonerG. The doner is the spit that holds the meat and stands as the logo for the restaurant too. 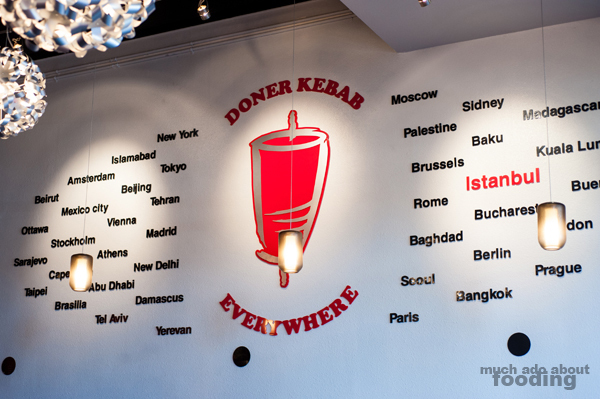 I really liked how one of his walls had the different places in the world that enjoy doner - it goes to show just how popular the style is. In fact, Yalcin revealed to us that donercis are just about on every block in some areas of Germany like Frankfurt! Getting to know Yalcin was enlightening not only about his background and the restaurant's story but overall about Turkish cuisine and culinary philosophy. For example, I really was unaware that the doner kebab was the first of its kind with gyros (Greek) and shawarma (Arabic) coming after. 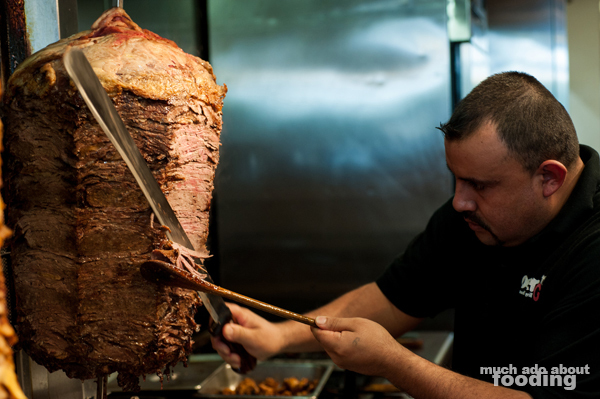 Even tacos al pastor (Mexican) was influenced by the doner which only means rotating/turning (as does gyro and shawarma). Bet you didn't know that, did you? 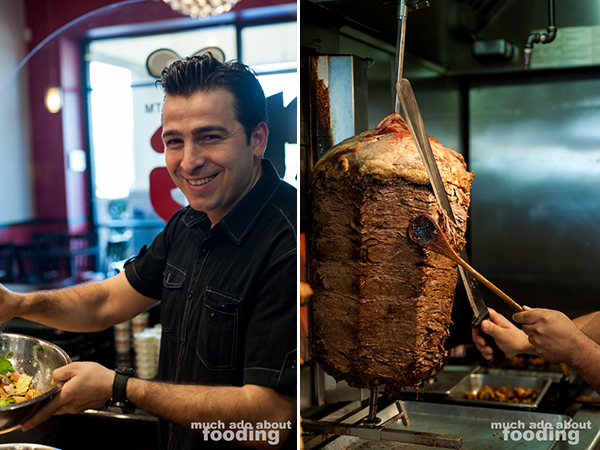 Yalcin himself came over to the United States in 2002 to earn his Master's degree but eventually found his way back into what his family had been doing for years, the food business. He had helped his father since he was only 9 years old and now continues the family's 25+ years in the restaurant business with his two DonerG locations, the first of which came to Anaheim in 2008. We were at the Irvine location which has only been open a few months. The Grand Opening celebration will be some time in May perhaps, and we are excited to see how the rest of Orange County receives the event. Apparently the immediate community in Irvine has enjoyed the food and enough so that Yalcin is looking to expanding to Mission Viejo and Newport Beach in the near future. Yalcin spoke fervently and frequently about the importance of ingredients during our visit. He emphasized the significance of Turkey's location and how it has affected cultural cuisine. As a meeting point for the regions of the Middle East, Asia, and Europe, Turkey has been influenced by all three and created a connection for them all through food palatable to all. One of DonerG's own philosophies reflects this cultural influence such that their "mission is to use food as a platform for bringing all different kinds of people together. Food is a universal language because it is understood all over the world as a main source of nourishment." The meaning of food is so impactful on the Turkish culture that only the freshest and best ingredients will do. DonerG focuses only on sourcing from local vendors to achieve their desired level of freshness and to support the local community. Yalcin expressed the difficulty in finding exactly the right kind of meat which he is accustomed to getting when cooking in Turkey; it must be fresh and the blood must be let out for at minimum two days lest the flavor get tainted by the blood's sourness. In fact, he claimed that some other cultures hide bad meat that is starting to rot by using a lot of spices whereas in Turkish cuisine, the ingredients are the star and rarely hidden behind any covering spices. We could easily believe that, and his attention to detail and source was very apparent once we took a bite of the food. To start, we had an array of starters to work on. Keep in mind that the picture portion sizes are not representative of the actual order sizes you could get - these were tasting plates! We had a plate of pita triangles with housemade hummus and baba ghanoush. The pita was quite frankly one of the best I've had because it was just simple and done well. 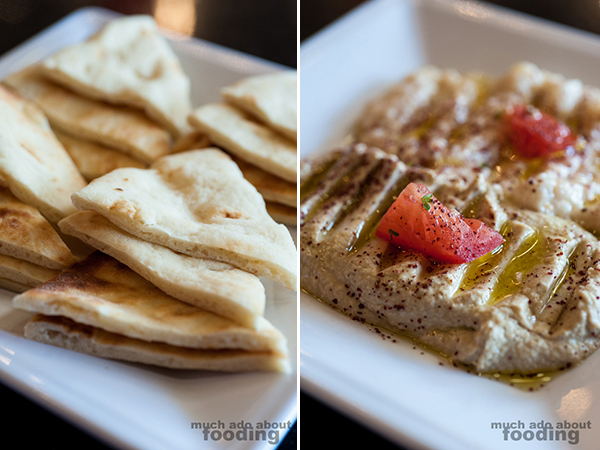 Soft and warm, the triangles made for a pliant dipper into the hummus and baba ghanoush, both smooth and clean. I personally had an affinity for the salad which used fried pita as if croutons and a light dressing with cracked sumac for added tang. This wound up being devoured as did a second portion. 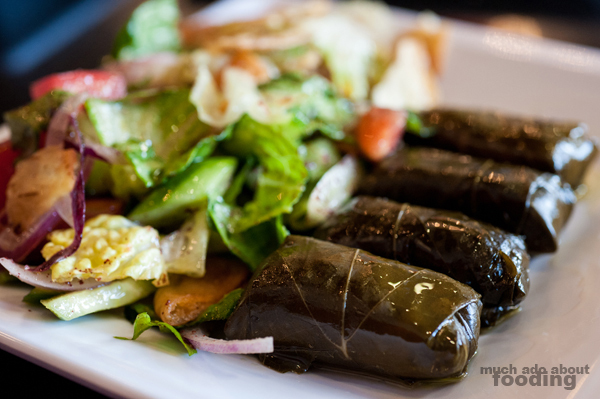 The dolmas were fair as well though I believe the travel time (these are imported) may have lent to their being slightly mushy inside. Because they are imported, these are vegetarian. What was impressive as we tried various items was knowing that all of the recipes had come from Yalcin himself. 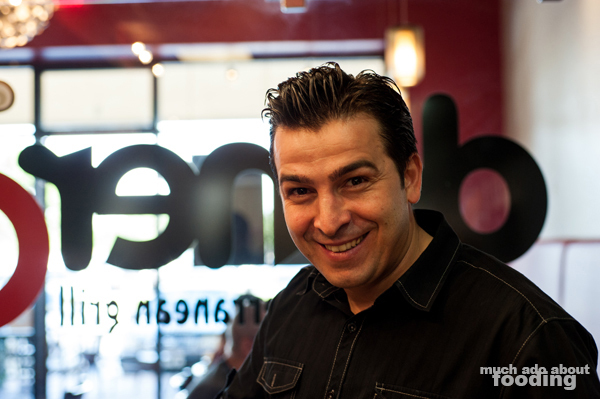 They have been adapted for improvement based on the years of serving Turkish food in Orange County but were originally developed from his own passion for cooking and experience with his family's restaurant business. He emphasized, also, the importance of having a Turkish chef prepare the food due to cultural ties and understanding of how certain dishes are to be made. In fact, though a chef can learn Turkish cuisine and style, the belief is that s/he will never be as great as a Turkish chef who has respect and loyalty to the homeland and has grown up eating home-cooked Turkish meals. 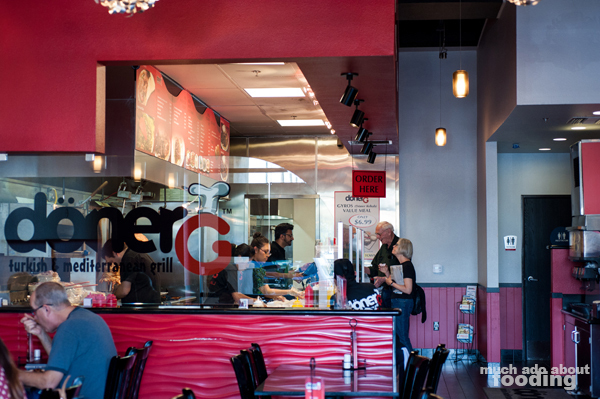 "DonerG represents the idea that good food and good company fosters great relationships. To build lasting relationships with our patrons, we believe in serving in our customers what we would feed our family and friends- fresh, healthy and authentic food." 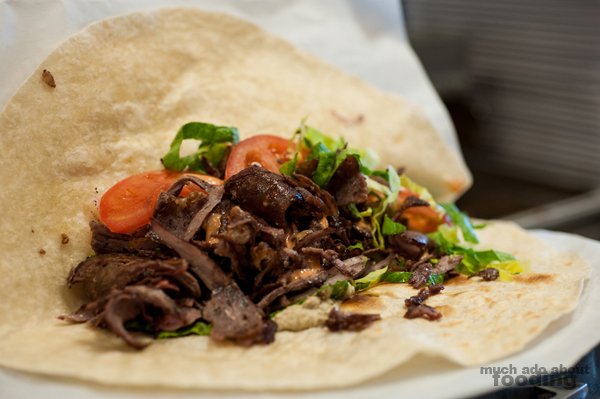 The meat is quite obviously the main attraction of any meal at DonerG. It is part of the reason for the restaurant's name so it has to be done perfectly. 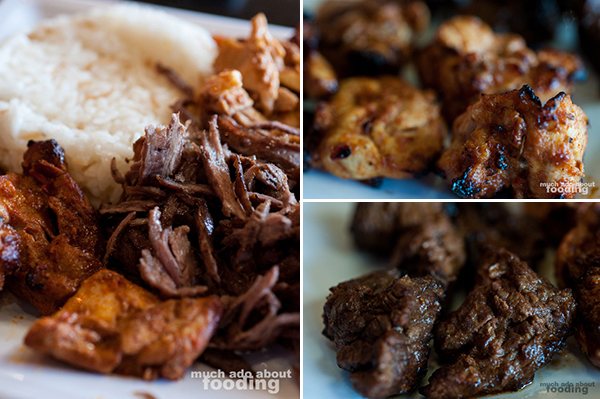 I think they very well near achieved that as the pieces we tasted had just the right amount of char around the edges and the flavorful, savory taste of doner kebab. 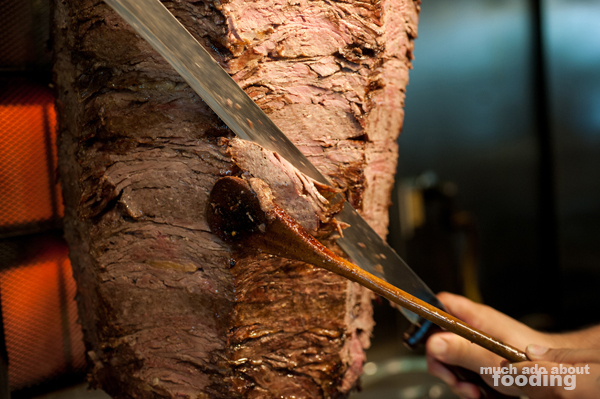 Each of the doners that gets loaded on a daily basis weighs in at approximately 100 pounds of meat, all of which had been layered onto the doner instead of ground into a meat mush that is shaped for the spit (yes, that happens sometimes). Two of these get consumed in just one day. Yalcin told us that in Turkey, some large festivals have doners that hold nearly 300 pounds of meat - crazy! His own is a 5:1 mixture of beef and lamb on one and chicken on the other, all kept perfectly tender and juicy by roasting slowly. In terms of entrees, their most popular with their guests are the pita sandwiches which come with any choice of protein for stuffing. There are also options for plates too which we wanted to see and were sure glad we did. There is something magical about the rice, and Yalcin even smiled knowingly at us when we fawned over every grain. Apparently it is the true favorite of guests' meals, and we were fans as well. What is the secret? Time and care. The grains themselves are Cal Rose rice which is soaked for an extended period of time to remove starch before being cooked for an hour. Then they are quickly stir-fried in oil and butter before being steamed again. 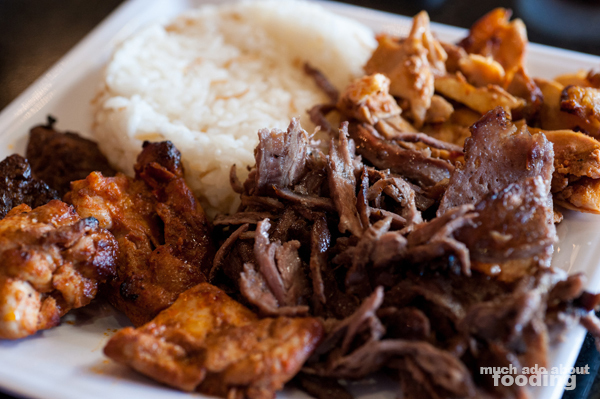 It is not uncommon that no matter what people order, they will always opt for an additional side of DonerG rice. 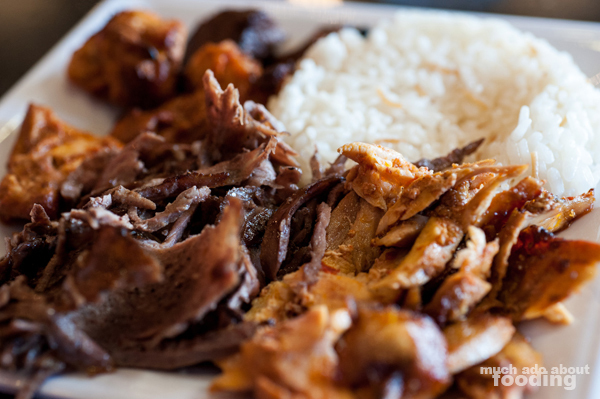 At the bottom of the plate, we were convinced that DonerG was the real deal. Though we hadn't had Turkish food before, it did carry a lot of the same themes we had seen in Mediterranean food but with a heightened sense of pride and perhaps quality. Yalcin was passionate about his food, his story, and the restaurant, and we are certain with that kind of drive that success will come easily. After all, this second location was already doing well from what we saw in the time we were there. It also has a charm about it in personality and quirkiness (check out their FAQ!) that makes you feel like you're just hanging out with a good friend. It's people like Yalcin that follow their dreams, make something out of their conviction, and do it well that I love talking too. If you want to find DonerG, they have a website at www.donerg.com and are active on social media as well. Our thanks go out to Yalcin and his team for hosting us. P.S. The baklava uses goat's milk and a lot of pistachio, making for a softer version of this dessert that made my eyes roll back in happiness. "Excuse me - may I have a tray of the baklava please...for myself?" Tagged for the Liebster Award by Yumology! #MushroomMakeover - Here I Go (Day 1)!